Support for Electrical and Optical Ethernet testing in a single module. IPv6 option to enable installation and troubleshooting of IPv6 networks. Modular hardware and software architecture is flexible and easily upgraded in the field. Allows testing of multiple services. Supports Triple Play and FTTX testing, as well as TDM network testing. Future-proof solution for circuit-switch to packet-switch migration. Fully configurable - buy only what you need now, easily upgrade as needs change. Rugged, hand-held platform ideal for field use. Ability to perform traffic generation up to interface line rate and support automated RFC2544 at Layers 2 to 4 (Eth/IP/TCP/UDP). Ability to generate and analyze traffic with various encapsulation schemes such as VLAN, VLAN Stacking (Q-in-Q), and MPLS. PPPoE protocol support for emulation of data traffic in the last mile. FTTX and Triple Play testing - Advanced tests for the installation and maintenance of DSL and PON-based Triple Play IP voice, video, and data services. xDSL testing - verify the circuit and service with modem emulation and replacement for ADSL, ADSL2, ADSL2+, G.SHDSL, and VDSL2. Complete copper testing including DVOM, TDR, wideband TIMS, spectral noise, and resistive fault locator (RFL). 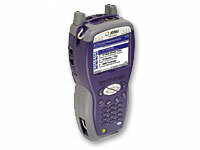 GigE and 10/100 Ethernet - Generate traffic and troubleshoot Ethernet links, both optical and electrical, for point to point or routed networks. North American 'Special Services' - Turn-up and troubleshooting for North American business-class data services: Ethernet, T1, DS3, PCM TIMS, PCM Signaling, DDS-LL, Frame Relay, ISDN PRI, ISDN BRI, and Datacom. Global Business Services - Turn-up and troubleshooting for global business-class data services: Ethernet, E1, ISDN BRA, G.SHDSL, and Datacom. TechComplete - Improve xDSL processes through automation and centralized, web-based management tools. 3.8" diagonal, 1/4 VGA, Color Active Matrix display. Simplified user interface to facilitate ease-of-use and minimize technicians learning curve. Handheld, rugged and portable. Lightweight (1.3kg/2.7lb). Weather resistant. Ideal for field use. Battery operated (up to 10 hours). Swappable battery pack. RS-232, USB and Ethernet connectivity. PC replacement - including file transfer, 8MB of storage, VT100 emulation, printing and internet browser. Built-in microphone and speaker. Headset connection.